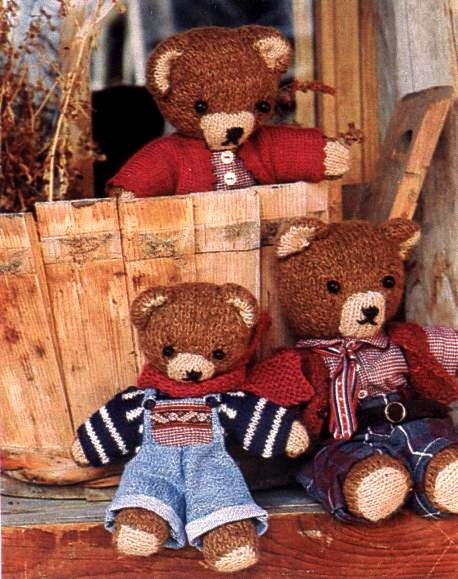 Teddy bear – children's favorite toys and popular gifts for adults, who enjoyed everything, thanks to the coziness and warmth emanating from them. Of special value are the toys created with his own hands – such a gift will become unforgettable for the person you want to please. So you can try to associate with their own hands a Teddy bear made from soft cotton yarn. 250 g soft yarn, a hook №4, as well as buttons or artificial eyes, and holofayber for stuffing toys. Tie eight columns without nakida on the main working thread, and then tie the cloth in a circular series. In the second row associate to each loop at two polostevichi with stitches to get 16 loops. In the third row within each second loop tie two polostevichi with stitches to make 24 stitches. The fourth row begins in each row to allow for eight loops. From the tenth to the eighteenth row knit circular rows without additions, and starting with the nineteenth number, promazyvaya together each the eighth and ninth loops to reduce their number. From the twentieth through the twenty-eighth series knit without bavleny, and with the twenty-first row evenly take eight loops in a row. Bind this method to the thirtieth row. Linking the trunk, fill it with holofayber. After the trunk link front paws. Tie on the working yarn loop and tie it with six columns without nakida. From the second row knit the round. In the second row provarite within each loop two polostevichi with stitches, and then knit by analogy with the pattern of the body. Provarite in this way twenty-one in number, and associate the second leg like the first. Tamp paws holofayber. In the same way as the front legs, tie the rear legs to the fifties series. Hind legs, stuff and sew to the body together with the front paws. Then tie your head with a pattern similar to the pattern of the body. Provarite 64 loop circular knitting, adding loops, then 4 cm of the canvas directly bind and finish binding head, subtracting the loops evenly to the top. Stuff the head with holofayber and close the hole. Tie the muzzle of a bear and the ears, sew them to the head. Finish sewing the muzzle to the bear 's eyes-buttons. The toy is ready.